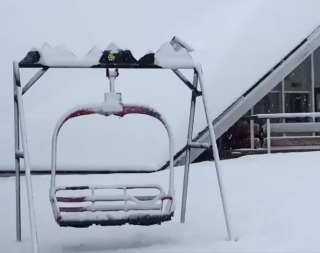 This Nov. 20, 2016, file photo shows snow blanketing a ski lift. Authorities have suspended a search for a skier reportedly caught in an avalanche near Lake Tahoe in western Nevada. Mount Rose Ski Tahoe spokesman Mike Pierce says one skier saw another get caught in an avalanche Saturday morning in a closed area of the resort. The Washoe County Sheriff's Office says search crews were recalled Saturday afternoon due to a continued avalanche threat. Meanwhile, the National Weather Service issued a flood warning until early Saturday evening for southern Washoe County and western Carson County due to rainfall amounts of 3.5 to 4.5 inches. News reports showed full creeks and flooded fields in Washoe County, and the weather service says flooding may occur farther south near creeks and drainage ditches on Carson City's west side.